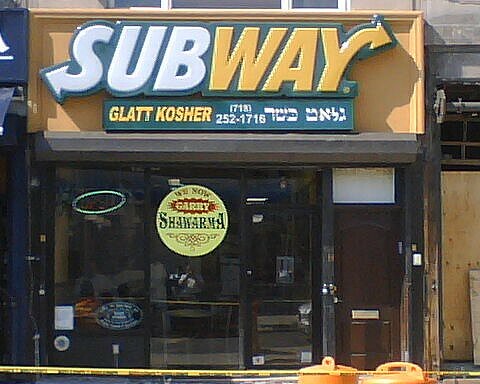 On Avenue J in Brooklyn’s Midwood section (known to orthodox Jews as “Flatbush,” though it is barely near Flatbush proper), LIKELIHOOD OF CONFUSION® encountered a glatt kosher Subway restaurant. We have discussed this issue before, or one very much like it (legally the same; religiously, not quite!). Some people may not understand what’s so odd about a kosher Subway store. Well, this tells you what’s on the Subway menu: It’s mostly meat sandwiches, of course. Kosher rules prohibit some of the sandwiches by definition, i.e., they cannot include any pork product, nor any mixture of meat or poultry and dairy (i.e., cheese). Furthermore, the permitted meats themselves must be produced (from slaughterhouse through serving) under kosher supervision — non-kosher beef is no more acceptable to a kosher consumer than ham or shellfish. This means the meat, besides probably being more expensive than that offered in a typical Subway store, has to come from another wholesale source. The menu is necessarily different (sub sandwiches usually mix cold cuts and cheese). And, chances are, it tastes different, too. There are many other issues, as the links in this paragraph explain. It’s a tough balance for a franchisor: What is more important, penetration into a territory and the concomitant franchise fees, royalties and brand development? Or maintaining uniform offerings and the highest level of trademark quality control, the sine qua non of trademark licensing? I don’t know of it’s still true today; but back when I looked into Subway franchising, the chain had some VERY aggressive growth targets. So penetration into new territories was a big deal for them. Of course, for them at the time, “new territories” meant “gas stations”. They may not have been the first fast food chain to embed in the corner gas station, but they made the practice common. I do think a little too much is made of standardized menus. When brands go international, they almost always make changes to their hallmark products to better suit them to their location. Even Coke[TM], perceived as one of the most uniform products in the world, modifies its formula for particular consumers. Coke in the Mediterranean region tends to have a bit more lemon; that in the Middle East, is a bit sweeter. McDonald’s regionalizes menus without blinking. You’re just not going to find a Quarter Pounder in New Delhi, you know. I suspect that anything with bacon is going to be scarce in the Tel Aviv or Jerusalem franchises. (Some franchises in the ME do use veal bacon as a substitute, though.) You can get a McDonald’s version of poutine in Quebec. Even within the US, some items appear in some regions and not in others. Even cigarettes are different. If you’re a smoker, you simply cannot mistake a US-made Marlboro from a European or Japanese Marlboro. Modifying menus should not be a problem for the major corporations who seek to operate branches in ethnic areas with strong dietary preferences. It makes the bookkeeping a little less tidy, but it shouldn’t affect the bottom line. There’s a Kosher Dunkin’ Donuts operated in the Detroit Metro region. I don’t see the big deal honestly. By the way, I’m pretty sure a Muslim could eat anything in a Kosher Subway. Yes, Dean, I think it mostly works in that direction. I’ve been i Japan for a month and the Mc Donalds here has a quite divergent menu, pork sandwiches, shrimpburgers, terriyaki and even tandori sandwiches….which are actually….wait for it…good. Ok I didn’t actually try the Mc Pork but everything else was good. In Maine, and New Hampshire McDonalds has a lobster burger that is quite good. McDonalds is the Alpha and Omega of standardized blandness….If they can do this anyone can, but I think that Kosher, or Halal poses considerable hurdles, as it severely limits the menu. That’s what I’d think, Ken.